Router Table Set Up Bar #6 - 7/16"
Kreg PRS3406 - Router Table Set Up Bar #6 - 7/16"
Whether you’re working on a table saw, router table, or shaper, setting your tool to the precise height necessary is absolutely essential. The exclusive 3-gauge design of the Precision Setup Bars makes them perfect a wide variety of applications. The concave step on the bottom of each setup bar straddles your router bit or saw blade to allow for precise height adjustment. 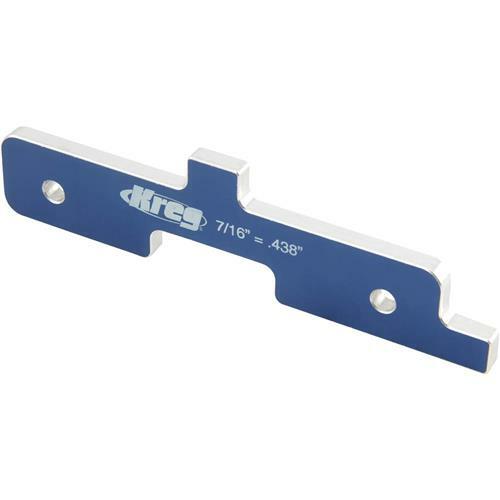 The step on the top edge of each setup bar acts as a gauge to test the depth of your completed cuts. The step on the end of each setup bar can be used to set the distance from a table saw blade to the fence, or a router bit to the fence.